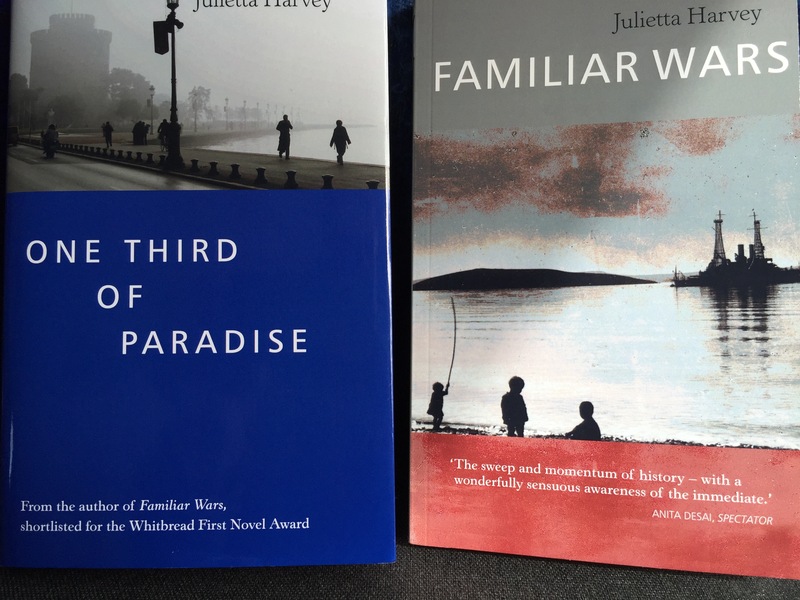 Earlier this month I posted about Julietta Harvey’s first novel, Familiar Wars, first published in 1987, now reissued with its sequel, One Third of Paradise; both are published by Polar Books on June 25th. In mid-air…she hovered naked and exposed, lingering over the threshold of home: pulled and pushed by currents of longing and loss. The author’s style has become richer, more textured than it was 28 years ago: on first reading, those images seem mixed, but on closer inspection they entwine successfully. As the aircraft which transports her home to Greece is buffeted by atmospheric currents, Eleni is herself emotionally turbulent, torn between the conflicting pulls of duty and repulsion; the alliterative plosives in the adjectives tumble in the sinuous syntax, verbally enacting her inner turmoil concisely and with precision. The central themes reappear: like her father, Eleni has fled her homeland to seek refuge, but she isn’t at home in her life of exile. Back in Greece she rekindles an adulterous, doomed affair. The gathered beneficiaries. Her sisters and their husbands appropriating, blaming. She wanted to turn back, before she became entangled yet again in old, disfigured resentments. That closing metaphor vividly conveys Eleni’s dilemma – she’s being drawn back into the family tragedy that she’d tried to escape; the noun phrase at the end of the quotation turns the abstract concept of her sisters’ resentful greed into a living, corrosive nightmare. And this is partly because Eleni herself acknowledges an impulse to appropriate, while feeling repelled by her family’s dysfunctional selfishness. The sisters blindly occupied their allotted territory. Sophia, the eldest, was in control; Kaliopi, in the middle, coaxed, bullied; Eleni herself, late and last, was the expatriate, the pariah. And those responsible for this angry geography were no longer responsible. But in her travels within that melancholy geography, through the city of dead ends, the meaning of family became indistinct. She tried to re-draw its clear lines, its natural geometry. Words like father and mother and sisters must have a meaning. They must belong to a natural order and must follow laws of love, loyalty, and obedience; they must dictate duties. But that syntax of feeling, which had once been unquestioned, with her mother’s death lost coherence. What are the duties to the dead, what to the living? Eleni stayed apart, but knew she was with them, one of them. She could not compete, but shared this passion of acquisition. It could unite them in love, but only brought war. Perhaps the cause was a common loss. Perhaps their greed was for a more remote, mystical unnamed prey. All three of them were caught in a triangle, that stretched its lines and angles to them at whatever distance. But now the remnant of home and family kept them pinned in one place locked in a vicious geometry. Until, when home and family finally went, the three sides might drift apart in peace and forgetfulness. It’s not necessary to have read Familiar Wars to appreciate this novel. We’re given from the start a clear sense of what happened in the past, and how it precipitated the events that take place here in a new domestic war. The novel goes on to show this tragedy develop as history repeats itself and the themes of love, loss, exile and refugees’ yearning for a home are portrayed in all their bruising, heartbreaking inevitability. The Aristotelian concepts of ‘eros’ and ‘amartia’ are invoked in the narrative early on: they drive the central characters towards their fate and I felt the process with a mixture of pity, fear and revulsion. In other writers this device might seem pretentious, but Greek-born Julietta Harvey is able to enrich our experience of this modern drama with a natural, compelling sense of an ancient tragedy that ‘enacted itself’, narrated in language that’s rich and sensuous, as I hope the extracts I provide here illustrate. He consented to give, in order to take, probably scheming escapes and petty deceptions. She consented to give in order to take, knowing this was an unnatural reversal. It was not fate, it was his own daughters who were killing him. He surveyed the relatives with superior indifference, native Macedonians all of them, landowners. Now she was dead, he was a foreigner to them, the travelling merchant, the refugee. As in Familiar Wars she finds herself assigned the role of the witch Medea, obliged to betray and desert her own father, exiled from him and her homeland. Her fate is beautifully, painfully, but not humourlessly, revealed to us in this intriguing replay of an ancient family drama. It’s less event-filled than Familiar Wars, more brooding, internal and intense – and probably stronger as a consequence. My preview copy of the novel was kindly provided by the publisher. In three previous posts I recommended some podcasts about books. Today I’d like to urge you to subscribe to KCRW radio station’s literary podcast, Bookworm – for links to an extensive archive of episodes click here. It is a NPR radio broadcast out of Santa Monica College, California. 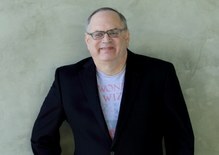 Its website describes Bookworm as a purveyor of ‘intellectual, accessible, and provocative literary conversations’; it showcases writers of fiction and poetry and the works they’ve recently published, mostly from North America, but with a wide range from across the world as well, as I’ll indicate shortly. The genial host, Michael Silverblatt, is a rarity in literary broadcasting: before going on air he reads (it seems all) that his interviewee has written, and clearly reads sensitively, attentively and with insight and intelligence. All of these qualities shine through in his conversations with the writers. He has a slow, pensive delivery in his interviewing style, and like Eleanor Wachtel of the CBC podcast Writers and Company, which I profiled recently, imbues his shows with a compelling blend of warmth, wit and perceptive, gently probing questioning that brings out intriguing responses from his guests, who clearly treat him with affection and respect. He has hosted this nationally syndicated radio programme since it started in 1989. For an interesting interview with Mr Silverblatt earlier this month on the LA Review of Books broadcast, Radio Hour, in which he talked about how he developed his deceptively relaxed but rigorous interviewing style, some of his favourite guests, etc., there’s a link here. Richard Ford is one of my favourite writers of fiction; he was interviewed in Jan. this year on his fourth volume of Frank Buscombe novels, Let Me Be Frank With You (which I wrote about here). In June 2012 he was the subject of two brilliant episodes on his novel Canada. Others that I’ve particularly enjoyed on the show include Colm Tóibín, Martin Amis, Ben Lerner, Sarah Waters, David Mitchell, and Kevin Birmingham (two excellent pieces on The Most Dangerous Book – his profile of the publication history of Joyce’s Ulysses). 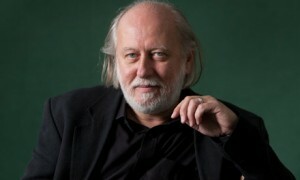 László Krasznahorkai has appeared twice – the first interview was in July 2012, when he spoke about Satantango, the second in June 2014, on Seibo There Below. I could go on: Margaret Attwood, George Saunders, Oliver Sacks, Cees Nooteboom (talking about his poetry), David Foster Wallace – just about every writer you’ve ever heard of has appeared – and several who were new to me, which is always good: I need to look out for Lydia Millet, Sjon and Yiyun Li, to name but a few who sounded intriguing on air. I recommend this podcast wholeheartedly. My first school was a British Army primary in Cyprus. My father, a soldier, was stationed there during the Eoka uprising in the fifties, when Greek nationalists sought union – enosis – with the mother country. This was the Megali – the Great Idea – the irredentist dream of a Greater Greece, the ‘union of Karaman and Ionia, the Black Sea and the Aegean’, as one Turkish character expresses it in this novel. From an early age, then, I was aware of the complex political history of Greece, and its troubled relationship with Turkey – which resulted in the Turkish invasion of Cyprus in 1974 and subsequent partition of the island – and the deep sense of nostalgia (a Greek word that dominates the novel) for its lost ancient imperial power and warrior heroes and guileful heroines. It’s helpful to have a sense of the historical background to this novel – which I lacked, so had to do a bit of digging; not essential, though, so ignore the next two paragraphs if you feel like skipping this contextual information. It’s set against the double diaspora of the Greek community of Ionia on the western coast of Turkey; this largely mercantile group (they were particularly famous as manufacturers and dealers in textiles) had settled there originally a century after the Trojan War. The Smyrna merchant cited by TS Eliot was an iconic representative of the culturally diverse but barely tolerated immigrant civilisation of Anatolia; for centuries the Greek Orthodox Christians had lived in uneasy harmony with the Turkish Muslim majority. Familiar Wars begins as a bildungsroman, following the development of Gregoris Gregoriou from his childhood just before the First World War as a merchant’s son in Mouryes, Ionia. But he is also representative of the fate of the doomed Greek Ionian community, from its apparent rise when Greece entered the war on the Allied side as a ploy to regain Constantinople and what it saw as its lost lands in Anatolia, its apparent victory with the Treaty of Sèvres which assigned Smyrna to Greece in 1919, through to the ‘Katastrophe’ or ‘world-large loss’ during and after the Greco-Turkish war of 1919-1922, which ended with the reconquest of the city by Kemal Atatürk and the slaughter of thousands of its Greek and Armenian inhabitants. Against this violent backdrop we follow Gregoris as he first loses his entire family then manages to escape into remorseful exile, on ‘the day of exodus’ for his Greek compatriots, on a ship to mainland Greece, where he sets about fulfilling his dream: to become an even more successful merchant than his beloved father had been. There are frequent references to the alluring appeal of America as a refuge for the ‘scattered, persecuted children’ of Ionia. Part 1 of the novel relates how Gregoris has to flee Smyrna as a refugee, alone, and finds himself in Macedonia, adrift, penniless. Part 2 shifts focus to his youngest daughter, Eleni, from the age of about five, to the novel’s end when she’s about to embark on a new life of university study. This part is essentially a second bildungsroman as she matures into womanhood and ‘war moved into the home’ – literally and metaphorically. I don’t want to give too much of the plot away; in brief, Gregoris builds a thriving business, becoming so obsessive about his shop and his quest to acquire ever more wealth that his family suffers, and hardship returns. The descriptions of his unctuous, flirtatious manner with his female clientele (he ‘pleased and obliged them all’) is offset by his selfishly emotional detachment from his family. He’s a beguiling, conflicted figure. In some respects then it’s a classic family saga, with a huge cast of subtly drawn minor characters. The central drama is the Gregoriou family’s experiences of love, loss, exile and yearning for a home -its own, personal enosis. Hence the narrative increasingly equates the family’s turbulent trajectory through history with key figures in Greek legend: Jason and his capture of the Golden Fleece aided by Medea is at times likened to the rapaciously ambitious Gregoris’ cunning greed. ‘Troy was down the valley from us, the Trojan War was fought just outside our village, only for her beautiful face. Just like yours. My land was full of Elenis.’ …Eleni drank his words telling her who she was, where her true home was, to what terrible stories she owed her name and life. She thought of those lost homelands, but as she thought and yearned for them, the pain of their loss brought, almost, the sweet finding of them…she was filled with the bitter-sweet music of nostalgia. Then there is Iphigenia, daughter of Agamemnon, who is sacrificed by her father to propitiate the gods into supplying a favourable wind to enable his fleet to sail off to the Trojan war. Eleni, from whose viewpoint most of Part 2 is narrated, comes to identify herself with these two daughters: Medea, ‘the traitor, the witch’, who betrayed her father and country by aiding Jason to escape with the Fleece by ‘cut[ting] her little brother into small pieces and scatter[ing] them in the Aegean Sea. Just like Turks do to the Greeks’, as the Ionian Greeks sometimes interpret the legend. Iphigenia in Aulis was hers. The father’s sea-voyage, and the sacking of Troy, and thousands of years later the burning of another Troy and another father’s sea-voyage from the fatal shores back to Greece, made up for her one story, beginning and ending with the prayer for good wind and the killing of a young girl. She shivered again at the sharp edge of the knife and of the parental mystery, and felt its flames consume her. as she watched with fear Medea, the witch, the foreigner and exile, the beautiful refugee from the Asiatic coast, the woman of nightmares, the daughter who betrayed her father, the sister who cut her brother into pieces, the mother who now holds the knife over her own children, consumed by the flames of jealousy. Medea the beautiful witch took Eleni into the exhilarating rages of womanhood, without shame. Without shame, with secret love, she thought of Olga, the other woman now in exile, accused of betraying sisters and brothers. Sons and daughters and brothers and parents. Medea’s words washed off the shame of love. Here we see Dr Harvey’s skill in portraying the interpenetrating themes and narratives of past and present, the shockingly familiar animosities and passions and the sometimes unfamiliar obsessions and profound dark mysteries of this east-Mediterranean people. Her mother Anastasia watches with growing consternation as Eleni becomes ever more like her restless, obsessive father, ‘her eternal admirer’; he ‘ brings out the worst in her’, she frets; ‘[i]t’s the Orient in her! The Asiatic blood! Her father’s daughter!’ He calls Eleni his ‘bride of Smyrna’, his ‘daughter and bride’, when she dresses up in his stock of fabrics and lace for him. She in turn, as the previous quotation showed, is jealous of her father’s love for her difficult mother, as Gregoris himself was when as a child he saw his father and mother together. Eleni’s soul is stirred by the soldiers’ music; she cannot hate them with the blind xenophobia of her family or compatriots – she is a loving spirit, unconstrained by convention or prejudice. She looks at the officer with the recognition of one deracinated, isolated human being of another. The contrast with her selfish, preening, scheming sisters is beautifully drawn. As these children grow up this filial passion develops, in some of them, into a destructive force. The adjective in the novel’s title has a double meaning: wars with which we are familiar from history’s cyclical repetitions (there were four Greco-Turkish wars after Greece won independence from the Ottoman Empire in 1821), and the internecine wars within the Gregoriou family. As we see Eleni growing into a spirited, intelligent young woman her siblings become openly, viciously greedy; by the end, as their father’s empire crumbles, the two elder ‘cruel, ungrateful daughters’ as he describes them, likening them to ‘snakes…Vipers’, resemble that other mythical, dysfunctional family: King Lear’s. Their venomous spite is doled out equally on each other and on Eleni: ‘They would get her: they would crush her’, she thinks at one point in her later childhood; they become ‘her enemies’. I’ve lingered too long on the family dynamics and socio-political historical-mythical aspects of this novel; I’d like to finish by commenting on Julietta Harvey’s prose style. She has a way of combining clear, unadorned description with lyrical, transcendent moments conveyed in poetic language that never clogs the narrative. There are numerous memorable set pieces like a community picnic, a marriage broker’s dealings with a suspicious family, or the formal opening of Gregoris’ new shop, that are Dickensian in their vivacity, wit and power. [Gregoris was] a migrant bird looking for refuge, a bird of bad omen perched, hungry, over her fate. His long blade-like beak and eyes red and tearful concentrated their aim. She lay quiet with fear of this man looking like her father: the woman’s motherly round silent shape gave her no refuge. Unwillingly she recognised her father – witness and reminder of atrocities, and refugee messenger from lands of pain and sorrow. He carried them in his visage, the black stubble on his hollowed cheeks remnant of fires, his worn clothes hanging on him hiding damage! The novel traces with rare honesty and insight the ambivalent, passionate intensity that’s to be found in many father-daughter relationships. There’s much more I’d like to say about this richly satisfying novel, but I’ve already gone on too long. It has many illuminating passages, for example, about the casual misogyny and swaggeringly patronising attitude towards their womenfolk that Greek boys and men were brought up to assume, and the submissive role allotted to girls and women; both Anastasia and her daughter Eleni are denied access to the education they yearn for by their dowry-obsessed parents, while Gregoris contemptuously, treacherously ignores his intelligent wife’s attempts to curb his more excessive business speculations or to check his impulsive, tasteless greed. I recommend this novel to you. 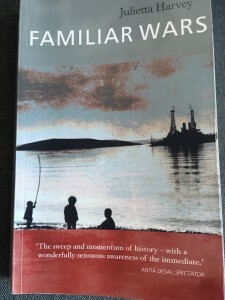 Julietta Harvey’s first novel Familiar Wars, originally published in 1987, is re-released on June 25 in paperback by the independent Cheltenham publisher Polar Books, along with its sequel, One Third of Paradise, which I intend writing about as soon as I’ve finished it. My thanks to the publisher for providing copies of both novels. In my two previous posts I’ve recommended some book podcasts. Today I’d like to recommend some offerings by the BBC. BBC Radio 4 is one of the best there is for factual and cultural material, surely, in any country; for a list of all of their podcasts, click here. They broadcast some interesting and stimulating programmes about literary matters. Here’s my pick of them. Each show contains additional material. A random example – on 21 May 2013 Louise Erdrich was the main interviewee, on her novel The Round House, but there was another item on F. Scott Fitzgerald’s The Great Gatsby, and the Baz Luhrman film of it that had recently been released. Also featured was a discussion of the Independent Bookshops award. A Good Read presented by Hariett Gilbert often throws up some gems; she has two guests each week, each of whom presents a favourite book for discussion. Ms Gilbert also recommends a good read of her own: she makes some great choices; she has good taste, and a pleasing broadcasting style. A random choice (from 29 October, 2013) – Richard Ford’s Canada; Chinua Achebe’s Things Fall Apart; David Sedaris, Me Talk Pretty Some Day. One of the most recent programmes included discussion of The Wilder Shores of Love, by Lesley Blanch; How to Get Filthy Rich in Rising Asia, by Mohsin Hamid; and The Islanders, by Pascal Garnier. As you can see, the choices are pretty eclectic, and range across authors from different countries and historical periods. It’s worth subscribing to this joint podcast: I’ve encountered many new works or writers I’d otherwise have missed, and enjoyed hearing other readers’ intelligent insights into works I’m familiar with. Recommended. The Guardian Books Podcast (the link is to the homepage, where further links to previous episodes can be found; also shows how to subscribe, download or stream from the site). Ably presented by the paper’s books editor Claire Armitstead. The quality of ‘author interviews, readings and discussions’ is generally very high. 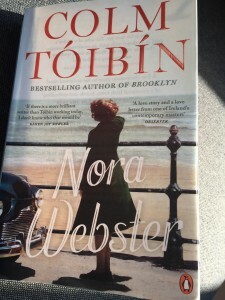 The most recent download available from 5 June was an interview with Colm Tóibín on the subject of women protagonists in his work, from his last novel Nora Webster (which I reviewed here) to his book about the poet Elizabeth Bishop. As always he’s on fine form (at one point he mistakes the name of one of his characters; his interviewer tactfully corrects him, but his riposte is wittily inventive). It was recently pointed out that only two Booker Prize winners since 2000 have featured female protagonists; Tóibín bucks that trend with aplomb. Other notable prose fiction covered recently includes an interview with Kazuo Ishiguro on the subject of his latest novel, The Buried Giant (from 26 March this year), and Richard Flanagan’s 2014 Man Booker Prize winner The Narrow Road to the Deep North (from 14 Oct. last year). Non-fiction is also covered. Most recently, on 16 April this year, there was an interview with John Lewis-Stempel, ‘peasant farmer’ author of Meadowland, winner of the 2015 Thwaites Wainwright Prize (links there to various related items, including his acceptance speech) awarded for the best writing of the year on the outdoors and nature. This item was paired with an interview with Sarah Hall on her novel The Wolf Border (Guardian review from 1 April here), which concerns a bizarre attempt by a northern landowner to reintroduce wolves on his remote borderland estate. Such themed items are regular; for example on 17 February 2012 the subject was historical fiction, with Kate Grenville and Hilary Mantel in the interview seats. The Guardian podcast regularly covers literature in translation. Some recent items include an interview (22 April) with this year’s Man Booker International prize winner, the Hungarian Lásló Krasznahorkai (whose novels Seibo Down Below and Satantango have languished on my TBR pile for far too long). Then on 11 April there was a feature on European fiction, including interviews with Peirene Press’s Meike Ziervogel, the French novelist Marie Darrieussecq, whose debut Pig Tales came out in the UK in English translation in 1996 (her latest is All the Way), and Dutch writer Peter Buwalda, whose first novel Bonita Avenue was published last year. On 10 May the literature of Africa featured, then Mexico (17 May); on 4 April 2014 New Indian Literature was the subject, and on 28 March, Korean – Hwang Sok-Yong, Hwang Sun-Mi and Yi Mun-Yol were profiled. Other work by non-English writers to be discussed on the podcast: from 13 February this year an item on South Korean poet and novelist Han Kang and the South African S.J. Naudé (currently published by And Other Stories). More well-known names to feature include Haruki Murakami (1 Jan. this year, on his latest, from 2014, Colorless Tsukuru Tazaki and his Years of Pilgrimage). It’s not all prose; poets to feature recently include Carol Ann Duffy, Liz Lochhead, Seamus Heaney, Simon Armitage, T.S. Eliot (a piece on the fourth volume of his collected letters, a podcast of 27 December 2013) and John Burnside. Sebastian Barry: James Joyce’s ‘Eveline’ – which I reviewed over at the Mookse and Gripes site here. I think you’ll agree that’s a pretty impressive list – and there are many more. Highly recommended. I intend adding profiles of more of my favourite podcasts soon. Have you any comments, recommendations or suggestions? Summer has finally arrived in Cornwall, and I’ve finished teaching for a few months; consequently I can write about a wider range of matters than usual. My last post about obsessive, even addictive behaviour among book acquirers and readers elicited a number of comments, most of them from avid readers who recognised the traits I described. Claire (of the Word by Word book blog), however, provided a corrective: addiction is perhaps an inappropriate term to have used. I was picking up on Belinda’s use (in her Bii’s Books blog) of the term ‘sugar addict at the end of Lent’ to refer to a book-buying splurge she indulged in after her #TBR20 project ended. No offence was intended when I likened bookish obsessions to addiction; I should have been more circumspect with my imagery. Today I’d like to depart in another direction from my usual run of thoughts about what I’ve been reading. I’ve been leafing through an old notebook – one of my obsessions also noted in my previous post: stockpiling and writing random findings about books and culture in these notebooks; I suppose they’re my equivalent of those 18th and 19th century ‘commonplace books’. I tend to keep a record in these notebooks of peripheral literary/cultural material: newspaper reviews, online articles and so on. I also listen to a lot of podcasts on such matters, especially when walking to work – just over half an hour is perfect for most podcasts. I looked up what I’d written in this one from three years ago. Here’s what I found in this notebook’s entries from June 2012. Edward St Aubyn (broadcast 25 March 2012), the Melrose novels. Why listen to such podcasts? They throw light on what one has already read, enriching that experience, through Ms Wachtel’s deceptively soft-toned but incisive, probing interviews with authors of books. They also provide recommendations for what to read in the future. It took me over a year to get around to reading these astonishingly raw, witty, viscerally disturbing novels, but they were a searing, brilliant read. 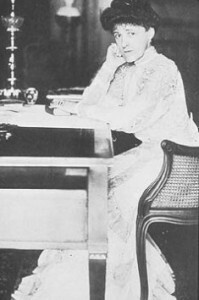 A broadcast of 22 April 2012 featured an interview with Hermione Lee on the subject of Edith Wharton, about whom she’d written a biography a few years earlier (there’s an excellent review of it by Hilary Spurling in the Guardian HERE). I found this podcast interesting because of my passion for the work of Henry James, with whom the scary New York socialite had an intriguingly weird relationship. Next I’d written about the BBC Radio 4 podcast of its long-running cultural programme ‘In Our Time’. There’s a link to its homepage HERE, where its complete archive can be accessed; this can be broken down into categories: Culture (including literature), Philosophy, Religion, Science. Recent topics covered range from Prester John to Utilitarianism; the Lancashire cotton famine during the American Civil War to the poetry of Tagore and the fiction of Fanny Burney. The item I’d listened to in June 2012 was broadcast on 14 Oct. 2010; it was on the topic of ‘Sturm und Drang’: the short-lived German proto-Romantic aesthetic movement of the late 18th century initiated by Klinger and adopted by Herder, Goethe (his ‘The Sorrows of Young Werther’, which I’d recently read in June 2012), Lessing, etc. It raised some curious points about masculinity and suicide, among others. The host, Melvyn Bragg, is sometimes lampooned in the British media for his implausibly luxuriant hair and adenoidal northern English accent. This probably says more about the snobbish prejudices of the English media than it does about Lord Bragg. Another time I’ll try to recommend some other book-based podcasts that I’ve found rewarding to listen to. They’re the audio equivalent of book blogs, I suppose. 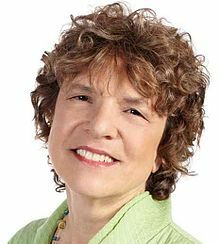 When they feature author interviews, however, they often provide insights unavailable to those of us who simply write about our own responses to what we read. I’ve dug out these notebook-archived pieces deliberately because they still resonate with me when I re-read them now, and attest to the quality of content in these programmes that persists today. I’d urge you to investigate and subscribe to the podcasts mentioned here. They’re all free. I have recently written here about the excellent literary-cultural studies by John Harvey of the colour black and here about clothes. Last year I included several pieces on his novel about Ruskin, Millais and Effie Gray, The Subject of a Portrait. The Poetics of Sight is ‘an intermittent history of culture’s “visual turn” through the last four hundred years’, during which time the subject of sight itself has become, until quite recent years, of primary literary and artistic concern. This book is mostly about the visual life of poetry and prose fiction and ‘about the poetic life of pictures’. Writing within the tradition of comparing pictures with poetry – ‘Ut pictura poesis’ – that stretches ‘from Horace to Hagstrum’, Dr Harvey focuses on the hitherto relatively neglected ‘human sense of sight’ in this debate, and in particular on the concept of the ‘visual metaphor’. In his Introduction he mentions how memories (like dream images) are often ‘momentary and fragmentary’ – the Proustian epiphanies of memory evoked initially by that novelist’s famous childhood madeleines, but then more revealingly by paintings and visual representations in the sequence of novels. Neuroscientists point out, Dr Harvey explains, how our way of seeing isn’t static but ‘saccadic’: our eyes dart here and there over what we perceive in order to create and maintain an understanding of what it is: this enables us to identify what we see. This is a consequence of evolution – it’s of great advantage to a predator (or predator’s target) to be able to distinguish quickly and accurately what’s dangerous from what’s edible. In a short review I can’t possibly do justice to the detailed and scrupulous consideration Harvey gives to a wide range of visual and literary artefacts; his analysis, to give just one example, of Titian’s paintings of Venus – two of the nine colour plates in the book; there are 36 monochrome illustrations — is inspiring – though I’d recommend accessing the images online: it’s helpful to be able to zoom in on the details he assesses. He begins with a chapter on Shakespeare’s ‘visual imaginings’ and the pictures by artists inspired by the plays. Then he turns to the uneven art of Blake, with its ‘element of wilful deprivation’ which is ‘a challenge to taste at any time’ as he strove to ‘keep his vision pure and Eternal’– but which is, at its best, sublime, like Blake’s best poetry. In his next chapter Harvey carefully examines the ‘migrations of satire’s scurrilous muse [wonderful phrase!] back and forth between visual and verbal art’, with attention to such figures as Gillray and Cruikshank, Pope and Dryden. Here too the ‘slow historic change’ involved the ‘visual or the pictorial “turn”’ that satire took over the centuries, in line with the growing fashion for the ‘picturesque’. When the fashion for satiric verse died out, it re-emerged in the novel, and subsequently in film. For me the most interesting sections of the book are those which deal with the novel (and there’s a superbly perceptive chapter on ‘metaphor and modernism’, and the ‘double metaphor’ of visual representation in the flat two-dimensional plane of a painting or photo). 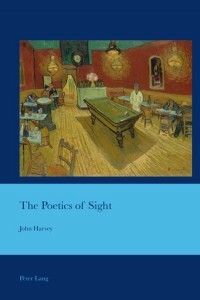 It’s only in the early nineteenth century that the novel ‘opens its eyes and aspires to a continuous visualization.’ Harvey shows how Austen pays little attention to the visual compared with Dickens, Thackeray and the high Victorian novelists, about whom he writes with subtlety, authority and insight: he moves from fictional landscapes in words to the importance of portraits on the walls of fictional characters’ houses – initially those of the aristocracy, then increasingly in those of the bourgeoisie. The wealthy figure in the portrait intimidated its viewer with its complacently land-owning gaze. Because Dickens’s feeling is more laden his visual details work as emotional metaphors. dances from consciousness to consciousness in an almost cinematic way, swooping and zooming, tracking one person till they pass another when all the individuals are themselves in motion, while also slipping rapidly between outward sight and inner picturings. As I did with his other non-fiction works, I particularly liked Harvey’s ability to argue his case in lucid, elegant prose, as I hope the extracts I have briefly quoted so far indicate. Notice his wittily revealing (nuanced, not ostentatious) use of visual metaphors in his exposition (the novel ‘opens its eyes’; POV ‘dances’; Dickens’s ‘laden’ feeling), for example. And there’s his usual mastery of prose rhythm and the well-turned sentence to express his argument with considered authority. His scholarship is judiciously deployed. I’d be interested to see a lengthier account by Dr Harvey of Henry James’s place in this discussion of art and literature: there are a few tantalising glimpses that whet the appetite for more. For now, I commend this book to you: it’ll change the way you read. Mine was a review copy sent by the publishers, from whose website the image of the book’s cover is taken.